This is your semi-regular thread in which fat women can share pix, make recommendations for clothes they love, ask questions of other fat women about where to locate certain plus-size items, share info about sales, talk about what jeans cut at what retailer best fits their body shapes, discuss how to accessorize neutral colored suits, share stories of going bare-armed for the first time, brag about a cool fashion moment, whatever. He never tells me when he's about to snap the picture, which is why I'm not smiling, lol; it was actually a very enjoyable evening! The boots I'm wearing are the ones previously featured in this series (three years ago! ), which I got at SimplyBe. 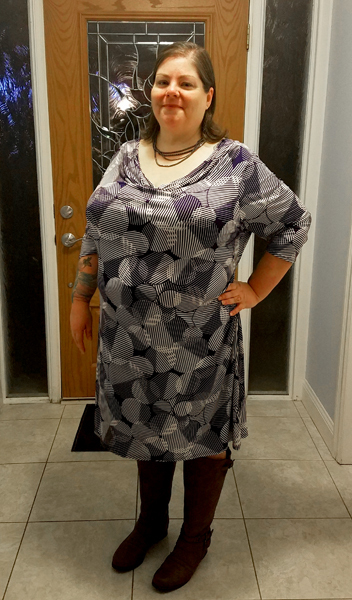 The dress is ModCloth's Idea Exchange Sheath Dress in navy, which I purchased on clearance for $19.97! It's no longer available in navy, but it is still available in coral, in limited sizes. I absolutely adore this dress. It's so easy! Just throw it on, add a necklace and some nice boots or shoes, and I feel like a million bucks. If it's not exactly the best twenty dollars I've ever spent, it's close! This pic isn't the best lighting to show off the colors, but I carried a bright coral purse with it, which was a terrific pop of color against the sedate navy. Anyway! As always, all subjects related to fat fashion are on topic, but if you want a topic for discussion: What's your favorite bargain piece in your closet? Have at it in comments! Please remember to make fat women of all sizes, especially women who find themselves regularly sizing out of standard plus-size lines, welcome in this conversation, and pass no judgment on fat women who want to and/or feel obliged, for any reason, to conform to beauty standards. And please make sure if you're soliciting advice, you make it clear you're seeking suggestions—and please be considerate not to offer unsolicited advice. Sometimes people just need to complain and want solidarity, not solutions.